With more strips installed Sunshine is beginning to take shape. I have had to rip and route additional strips to add to my original supply. Some of these are at 3/4" like the originals, but some are 5/8" wide. 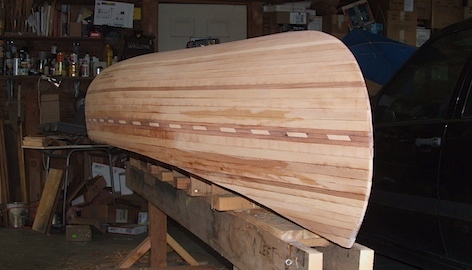 With 5/8" strips only about 1/2" is added on the canoe with each strip. However, the narrower strips are more easily installed considering the sharper compound bent in the bilge area. In this picture I have installed about six of the 1/2" strips, including one contrast strip of pine. 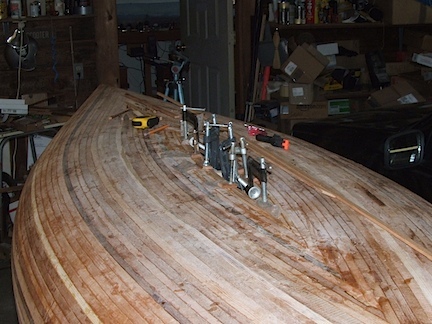 Installing the strips in the bilge area was more difficult because of the compound bend. Just as I was getting used to bending the strip in two directions at the same time, I reached the bottom area. Now, once again, I'm bending the strips mainly in one direction. Also, they are getting shorter so less time is required. Here the smaller strip pieces are fitted to the bottom where everything comes together. Lots of clamps are needed here. The strips are short and don't bend into the cove very well. The image on the right shows the final center filler piece in place. This piece is less than 3/4" wide and was carved from a stick of redwood. This is the only piece that has not required a clamp to hold it in place. 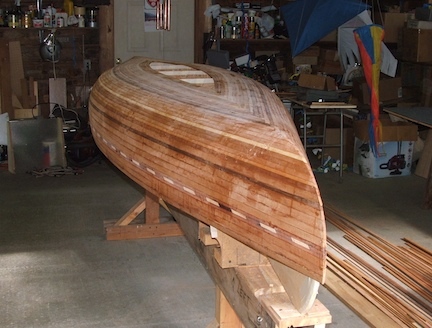 A sheerline that curves up at the bow and stern stems of a canoe is what gives it its unique appearance. A few more sheer line strips are yet to be installed. I clamped this small batten to the side to get an idea of where I might cut the sheer line. In this picture the sheer lines are rough cut. 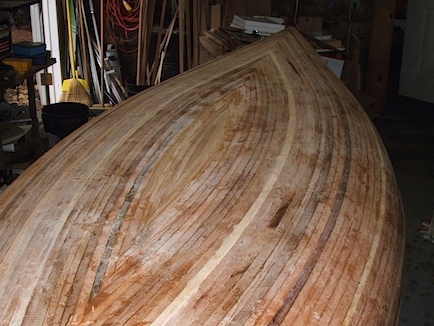 This will be the final determining factor for the shape of the canoe. 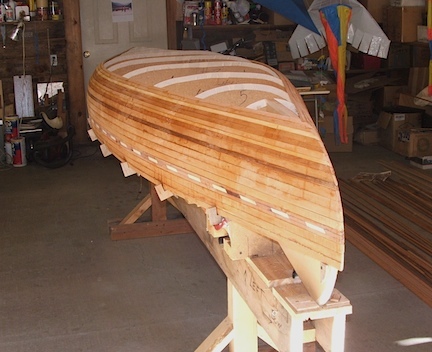 The lines are cut about 1/4" proud so any final shaping can be done with a spoke shave and sanding block, while I'm installing the gunwales and decks. Some sanding has already been done here.